Mystery, the occult, adventure, and the supernatural are all melded into one fantastic story in The Last Odinian by Alec Arbogast. It’s a novel with a strong appeal to fans of urban fantasy. Guided by a telepathic message from his daughter, Edward Koenig comes to Pinemist Bay to find his family. In a town where nothing is what it seems, he knows his wife and daughter are in danger. Pinemist Bay has a shady past intrinsically linked to a pagan Scandinavian rite that has long been forgotten. Follow this character as he acquaints himself with a dangerous cult and navigates the less trodden paths of this mysterious town, risking the darkness that could swallow him. Can he confront the dark past of this town and still be same again? Will he be able to reconnect with his family and save them, with many evil eyes around him and strange happenings? There is a lot to enjoy in this novel and what caught my attention is the meticulousness with which Alec Arbogast handles the setting. One gets the feeling that this is a story as much of a place as it is of the protagonist. The descriptions plunge the reader into the details of the woodlands, the strange topography, and the peculiarities of the city. The sense of mystery is so strong that it arouses the reader’s curiosity and builds the tension. I got hints of Norse mythology in the writing and it is skillfully woven into the language. The pacing is measured, neither too fast nor too slow, but it is the author’s ability to sustain the reader’s attention that makes the story stand out. The Last Odinian will grab hold of your attention if you love beautiful and descriptive prose. The Last Odinian is a dark supernatural fantasy novel written by Alec Arbogast. Edward Koenig felt far out of his depth in the strangely sombre little town of Pinemist Bay. As one would expect, the Pacific Northwest location was blessed with unrelenting rain, rain that seemed to penetrate deeply into his bones. The winds howled mournfully, increasing the gloomy atmosphere he found himself in. Pinemist Bay was a world far removed from his urban Chicago environs, but he had no choice in making the long trip and retracing the journey taken by his father before him. Edward was still reeling from the pain of the separation his wife had demanded after his last bout of drunkenness and infidelity. When he began hearing his four-year-old daughter’s voice begging him to come to Pinemist Bay and rescue her and her mother, Edward had no choice but to obey. 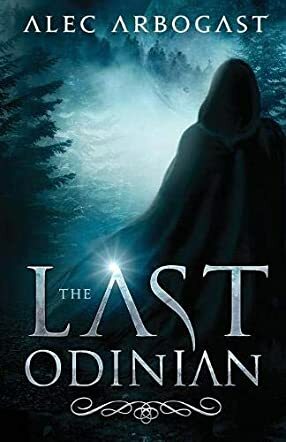 Alec Arbogast’s dark supernatural fantasy novel, The Last Odinian, is a chilling and atmospheric tale about parallel worlds and a dark legacy that had enslaved a small rural town on the Pacific Coast. I loved the mythological elements that the author weaves throughout this well-written and compelling story, and reveled in the spooky and unworldly events and personages Edward encounters on his quest to rescue his family -- and himself. Arbogast provides just about everything a dark fantasy lover could look for in a novel; there’s even a nightmarish asylum whose gruesome history and hidden basements compete with the awful living situations of the patients still residing there. His characters are credible, and his plot grabs hold of the reader and doesn’t let go. The Last Odinian is an impressive debut novel indeed; it’s most highly recommended. In Alec Arbogast’s The Last Odinian, Edward Koenig is separated from his wife and daughter by past indiscretions. Now he is driven by a mental message from his four-year-old daughter, Dalla, claiming that she and her mother have been taken against their will. He finds himself retracing the path of a business trip his father took decades ago to Pinemist Bay in the Northwest, but which left his father broken for the rest of his life. As Edward explores Pinemist Bay in search of his family, he struggles to separate reality from nightmare, but, with the help of some local citizens, he begins to uncover the horrific truth behind the seemingly placid, rain-soaked town’s dark history of torture and sacrifice at the hands of a diabolical cult called the Vucari. In The Last Odinian, Alec Arbogast paints a dim, rain-drenched landscape through which Edward Koenig, a bit of an anti-hero, searches. We would not be surprised to find the pages of the book damp to the touch, or mildewed and muddy. Edward’s research of pagan rituals, originating in Sweden but enriched by an influx of Slavic invaders in the distant past, lends the book an authentic flavor. The book also possesses elements that evoke Stephen King and H.P. Lovecraft and television series such as The X-Files and Fringe. However, Arbogast gives them his own unique twist and creates a supernatural thriller peopled with an array of characters as believable as any encountered in life. Those who love a compelling mystery mixed with the supernatural will enjoy The Last Odinian. A very readable book!